ZH oil-free centrifugal compressor range. The expanded range is led by the new ZH+ and ZH 630-1600 kW compressors, which is said to offer high-end turbo technology in a highly efficient package with a small footprint. Joining the recently-launched ZH 355 to 900 kW compressors, the updated line-up replaces the former ZH 4000 to 15000 range. Overall, the new range is said to offer users a total energy efficiency gain of approximately 6%, thereby allowing customers to achieve a smaller electricity bill year-on-year. 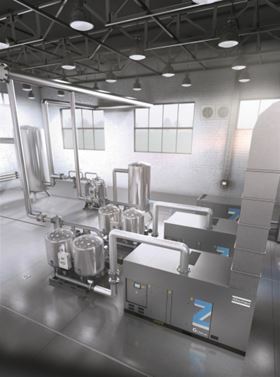 Additionally, the smaller footprint of the new machines, compared with their predecessors, makes for easier installation and location of the units within a multitude of process environments. Atlas Copco says the entire range of ZH+ and ZH compressors is certified to provide 100% pure, clean air that complies with ISO 8573-1 CLASS 0 (2010) certification. This standard means zero risk of contamination, zero risk of damaged or unsafe products and zero risk of losses from operational downtime. Atlas Copco was the first manufacturer in the world to receive such certification for its oil-free compressor.